One of my favorite cookies are the ones you get in a little green box from the Girl Scouts. Thin Mints. Mmmmm! I could finish a whole box in one sitting if I *had* to 🙂 I love the combination of chocolate mint. If you do too check out my Andes mint cheesecake. 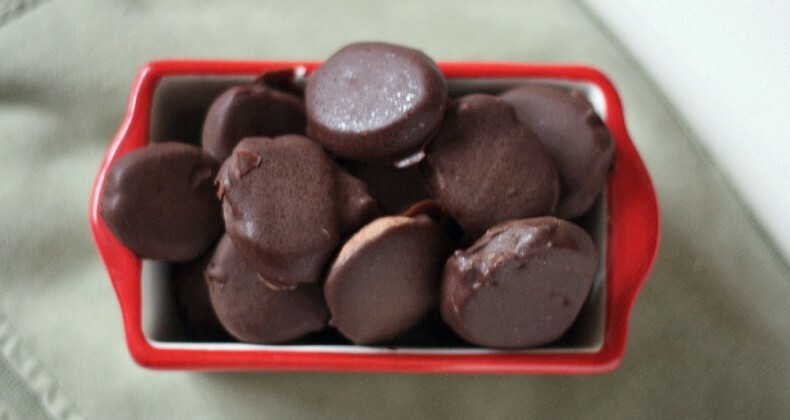 One day awhile back I was browsing Foodgawker and found out there was a recipe for Thin Mints you could make at home. You mean I don’t have to wait for the Girl Scouts for these cookies?! I had to make the immediately! After making them I realized they would be the perfect addition to my Christmas treat platter. I first saw these on Crepes of Wrath’s site and she found them at Baking Bites. This batch I whipped up IÂ substituted Multi-Purpose gluten free flour the flour in the recipe. If you really like mint I recommend adding more mint extract –I didn’t find them minty enough for my liking. I recommend keeping these in the fridge or freezer until you’re ready to serve them. The chocolate coating might get a little soft if kept at room temperature for too long. In a large bowl, cream together butter and sugar. With the mixer on low speed, add in the milk and the extracts. Mixture will look curdled -its ok it is supposed to. Slowly, add in the flour mixture until fully incorporated. Shape dough into two logs, about 1 1/2 inches in diameter, wrap in plastic wrap and freeze for at least 1-2 hours, until dough is very firm. Slice dough into rounds not more than 1/4 inch thick â if they are too thick, they will not be as crisp â and place on a parchment lined baking sheet. Cookies will not spread very much, so you can put them quite close together. Bake for 13-15 minutes, until cookies are firm at the edges. Cool cookies completely on a wire rack before dipping in chocolate.